Looking for 70 Series circular backshell? SEE and COMPARE the benefits of EA Series E11 & E32 Competitive Products! The Electro Adapter Series E11 & E32 are pre prepped and ready to use circular Shield Sock adapters providing cable fabricators an EMI/RFI enviromental solution to power and signal cabling. These backshells have a shield sock attached to the rear of the circular adapter body; the shield attachment is a magna formed band. This shield sock is then attached to the overall braid on the cable or harness. 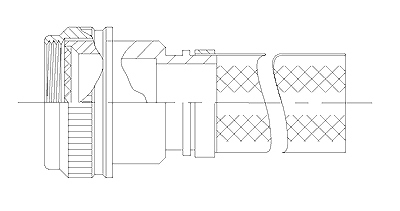 This attachment is most generally performed by the use of a Shield Split Bushing part number 900-859 or, MIL-C-85049/93 back-up ring and then banding the over-lapped braids together. 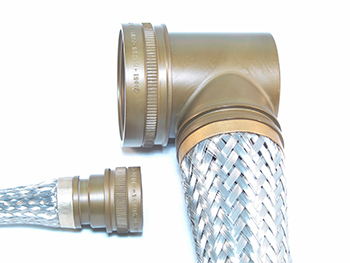 Lipped-type heat shrinkable boots are available to enclose and protect the termination. Another option is to use heat shrink tubing to enclose the entire shield sock and shield junction with one piece of thick wall tubing eliminating the cost of adapter boots. There is also an adhesive shrink tubing version that performs well. Electro Adapter Series E32 is a low Profile version of the Series E11. The product offered is developed and manufactured by Electro Adapter, Inc. Please note that our products may not be an exact copy so certain details may be slightly different. Please refer to the Electro Adapter drawings available here for determination if our details will be in conflict with your applications.